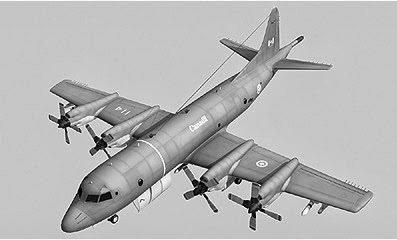 The CF's 18 CP-140 Aurora maritime patrol aircraft were first acquired in the early 1980s to replace the CP-107 Argus and to support Canada's anti-submarine warfare mission obligations under NATO for the northwest Atlantic sector. AIMP is divided into three 'blocks". Block I is complete and concentrated on the replacement of unsupportable systems. Block II brought a glass cockpit with the Navigation and Flight Instruments (NFI) component provided by CMC Electronics, and a complete replacement of the communications suite. Block III is a wholesale replacement of the aircraft's sensors and mission computer. The Aurora Structural Life Extension Project (ASLEP) provides for new wings and the replacement of key structural components. The complete ASLEP solution replaces the aircrafts' outer wings, center wing lower section and horizontal stabilizers with new production components. All fatigue-life limiting structures on the aircraft are replaced with enhanced-design components and improved corrosion-resistant materials that will greatly reduce maintenance costs over the aircraft's service life. This program is expected to extend the CP140s' service life by 15,000 flight hours per airframe. Increasingly the CP-140 is employed for domestic and international surveillance by CANCOM for security, counter-terrorism and smuggling, as well as to monitor foreign fishing fleets off Canada's coasts. CP-140s have also been deployed on operations such as Operation Assistance and Operation Apollo. In December 2007 the government first announced that they would pursue the acquisition of a new surveillance aircraft while continuing to upgrade and life-extend the CP-140 Aurora fleet. In 2008 it was decided that 10 of the aircraft would receive the full modification. It was recently announced that the DND will update another 4 of the Aurora long range maritime patrol aircraft. The four-engine planes will now be in use until 2030, extending their life cycle to more than 50 years. It did not take long for critics to weigh in and announce that it signaled another failure for the government’s procurement system. It has been pointed out that the decision to modernize and life-extend 14 of the Auroras is by no means perfect – compromises rarely are – but it will permit the retention of critical maritime surveillance (i.e., marine domain awareness) and other capabilities until such time as a credible successor can be secured. The decision to add to the number of updated aircraft acknowledges the flexibility of fixed-wing maritime patrol/ISR (intelligence, surveillance and reconnaissance) aircraft for military, quasi-military, and non-military roles. It also acknowledges the importance of potential overseas requirements for a credible Canadian maritime and overland ISR capability. The option of not having this capability would not be without cost. It is instructive to watch the search in the deep reaches of the Indian Ocean for Malaysia Airlines flight MH370 being conducted by the Royal Australian Air Force and its allies. When the United Kingdom felt it had to forgo its Nimrod program because of fiscal mismanagement they lost any long range maritime surveillance capabilities. It is interesting to consider that if an aircraft went missing a thousand miles off the coast of Britain, the RAF would not be able to take part in the search. In that context, the prospect of having only 10 fully modernized and life-extended Auroras split between two bases thousands of miles apart would have made maintaining extended surveillance of a target of interest 1000 miles from shore a virtually impossible challenge. It is also true that having 14 airframes available for use is a bare minimum. With the small fleet now envisioned, the aircraft will experience increased use and in turn a decreased life span in an attempt to fulfill the same tasks, which as far as we know have not been changed, with fewer resources. Canada has the longest coastline in the world and with few other resources available to accomplish these tasks it may be that more aircraft will be necessary. There is a case to be made that at least two more airframes could be given a limited update to allow their use as training and arctic surveillance aircraft. Two of the CP-140A Arcturus variants, originally procured for just this purpose, are currently parked in the Arizona desert under the watchful eye of the 309 AMARG. With an estimated with 10,300 flying hours and 23,000 landings on each airframe one can not help but wonder if the SLEP portion of the upgrade would not benefit those aircraft and produce an economic and useful adjunct to the Aurora fleet. As Bill Sweetman has pointed out, aircraft are expensive to design and build and have a cradle-to-grave product life that is far beyond either political or technological horizons. Long life requires adaptability, both across missions and through-life. The CP-140 Aurora may end up spending fifty years in Canadian service. As long as the platform is sound and the sensors and communications kept up to date, there is nothing intrinsically wrong with this. A search for a replacement should be a search for a better way of accomplishing the mission. For the time being it appears that the best replacement for an Aurora is another Aurora. Opinion: Is Saab’s New Gripen The Future Of Fighters?